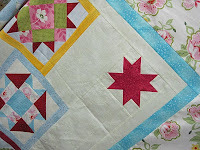 It's been so much fun choosing fabric for our version of the Twin Cities Shop Hop Quilt 2010. Laurel designed the quilt, sewed all the blocks and Pam is quilting it. We hope you love it as much as we do! We will have plenty of kits available in case you do!